Frankfurt Airport (FRA) is Europe's second largest airport, flying 50 million passengers a year between Germany's capital of finance and most international destinations. As Germany's premier airport, Frankfurt International Airport now serves more routes than London Heathrow. Located eight miles (12 kms) southwest of Frankfurt, FRA benefits from excellent land, air and river links. Direct rail connections to Frankfurt City are provided by S-Bahn commuter trains, with RegionalExpress (RE) and StadtExpress (SE) trains serving remoter destinations. FRA links to the A3 (Cologne-Munich) and A5 (Hanover-Basel) motorways. Facilities and services at FRA's two terminals include a selection of quality shops, bars, restaurants, business, banking, family, medical and special needs amenities, many operating on a 24-hour basis. 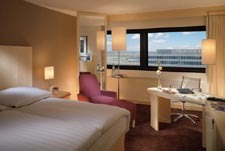 Frankfurt World Airport Guide provides you with access to a complete selection of Frankfurt airport hotels. Utilize the discounts offered directly from the hotel, with the assurance of secure booking. 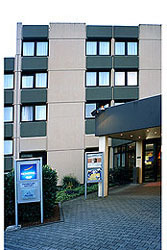 Extra services include airport car rental, airport car parking and flights to and from Frankfurt airport. Please note: The term Frankfurt Airport FRA as well as all associated graphics, logos, and/or other trademarks, tradenames or copyrights are the property of the Frankfurt Airport authority and are used herein for factual descriptive purposes only. We are in no way associated with or authorized by the Frankfurt Airport authority and neither that entity nor any of its affiliates have licensed or endorsed us.